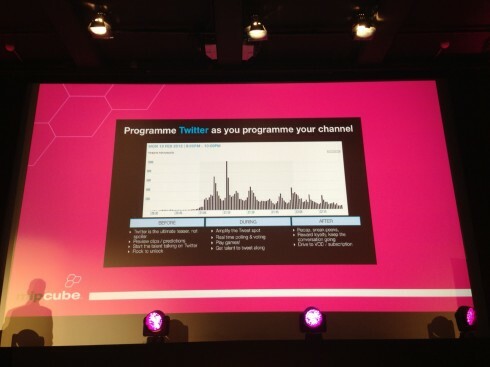 This morning Twitter’s UK head of broadcast partnerships, Dan Biddle (@danbiddle), provided a number of examples for using Twitter to improve TV interaction at today’s MIPCube Talks session. Twitter has 200 million global users, who post about 1 billion tweets every 2.5 days. 60% of those users access the site via mobile; the number is 80% in the UK. His examples included Channel 4, whose documentary Dogging Tales generated 120.2 million Twitter impressions with hashtag #doggingtales. People felt like they needed to watch it when talk about the show overloaded their feeds, and catchup TV also benefited from the Twitter deluge. But you can also be a little more creative. For their show Saturday Night Takeaway, the @antanddec team kicks off weekly with a frozen pose. Realising they could “get the audience to do stuff before the show,” which would get people worked up for it, they started asking followers what their pose of the week should be. this became their call to action; they now receive poses in droves. Another example was #Fishfight, which seeks to raise awareness for unsustainably fed prawns. For a commercial break, the show encouraged users to tweet supermarkets with the question, “What are your prawns eating? #fishfight”. 16,000 tweets poured in during the break. “They had a two-minute window to do the activation. But the campaign was enlargened, and the show was made more engaging,” said Biddle. He then mentioned @pac12, whereby ESPN tweets instant replays. “They know someone else is gonna do it; they might as well be first to market and have their brand attached to that content,” said Biddle. He wrapped by encouraging us to amplify the tweet spot, much like Oreo did when electricity was suddenly cut off at the Super Bowl. (Incidentally, Twitter was mentioned in 50% of Super Bowl ads this year.) Its timely “You can still dunk in the dark” ad, shared on Twitter, generated over 15,000 retweets and more than 20,000 likes on Facebook. “Think about programming Twitter as you programme your channel. Get people engaged, talking beforehand. Give them extras,” Biddle finished. To provide general ideas of the many ways to “programme Twitter”, he shared the following slide, loaded with helpful network- and brand-relevant ideas. Plenty to take away!